Keeping with the Easter theme, today we’re talking about the world’s biggest basket (which becomes the world’s largest Easter basket but only between Palm Sunday and Easter Sunday). 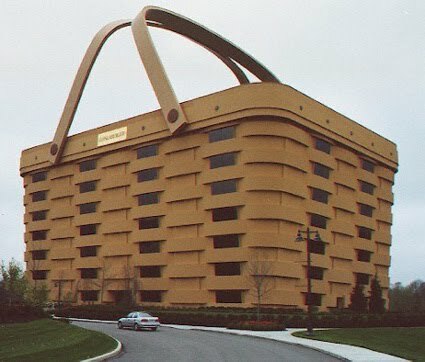 The basket is a 160x replica of Longaberger’s Medium Market Basket and is used as the Longaberger company headquarters. Between Palm Sunday and Easter Sunday large replica eggs are added to the top of the basket. It weighs more than me. This entry was posted in Uncategorized on April 3, 2010 by fatchicksings.